The creation of marine protected areas (MPAs) may be the single most important step we can take to protect what we all need to survive – a healthy ocean environment. MPAs are places that are set aside to provide sanctuaries for the species that live there and migrate through. The size of MPAs can vary from one acre to hundreds of thousands of square miles. MPAs can take many forms, from closed areas, locally managed MPAs, harvest refugia, to multiple-use areas and biosphere reserves. The types of restrictions vary from “no take” reserves (no fishing or extraction of any kind) to limited commercial and recreational activities like those found in a National Marine Sanctuary. Less than four percent of the ocean is currently protected, lagging considerably behind the 16 percent of land that is protected. Considerable progress has been made in the last decade however. In 2006, only an estimated 0.65% of the ocean was protected. Today there are approximately 6,800 Marine Protected Areas, only half of which are classified as “no take” marine reserves, completely closed to fishing and other extractive activity. Many of the MPAs in the world are “paper parks” with little restriction or enforcement. Depending on where MPAs are established, the authority for managing and monitoring can be local, state, community, territorial, or national. Given the limited number of sanctuaries and their limited protection, many continue to be stressed from extensive and often illegal use. There is an urgent need for the continued creation of MPAs and better management and enforcement of existing sanctuaries. Healthy, intact marine ecosystems are important for a number of reasons. Two common examples of our dependency on the ocean’s health are seen in our food supply and our air quality. Saline-based fish provide 500 million people with their primary source of protein and 3 billion people rely on fish to fill at least 20% of their protein needs. With ocean health deteriorating, fish are not reproducing as efficiently therefore decreasing the supply available to the people dependent upon them for food. Marine protected areas create havens in which food for the fish is plentiful and the surrounding conditions are healthier thus giving them a safe place to grow and reproduce to increase their population. These designated areas protect one of our most valuable resources derived from the ocean. It may seem as though the air has nothing to do with the ocean, however they are undeniably linked in a way that hugely benefits our world. The ocean is able to absorb amounts of CO2 out of our terribly polluted atmosphere. Especially in current times when we are spewing massive amounts of carbon dioxide into the atmosphere, it is very important to protect the ocean by any means possible. The average annual 2.5 billion tons of CO2 that the ocean absorbs, found by the Scripps Institution of Oceanography, doesn’t just disappear and stop causing problems. In fact, it is a major contributor to ocean acidification. Protected zones will allow the natural resilience of the ocean to take over and the large amounts of CO2 that the ocean is absorbing will more easily be dealt with. Fish feces, an alkaline substance, help to counteract the acidity created in the water from the high CO2 levels. One way that protected zones help with the acidity is by allowing more fish to live and reproduce thus inherently creating more alkaline feces. With a healthier ocean that can effectively absorb and manage more CO2, the atmospheric quality rises. MPA’s allow the ocean to heal and reach its full resilience capabilities in order to most effectively balance the CO2 levels in our atmosphere. Healthy, intact marine ecosystems are important for a number of reasons. Two common examples of our dependency on the ocean’s health are seen in our food supply and our air quality. Saline-based fish provide 500 million people with their primary source of protein and 3 billion people rely on fish to fill at least 20% of their protein needs. Marine “no take” reserves offer the most promise for our oceans. Taking a holistic ecosystem-based approach, no take zones are the most essential designation needed to maintain, protect and restore the health of marine ecosystems from multiple stressors. In no take zones, marine habitats are protected from harmful fishing practices, allowing habitats to remain intact and free from destruction. The fish are able to grow large and as a result, have more off-spring, increasing the number of fish that can swim out of the reserve and into neighboring regions. More than 10 percent of the land in the US is protected in national parks, wilderness areas or wildlife refuges; however, less than one percent of the ocean is protected. Also included in the U.S. inventory are the 27 National Estuarine Research Reserves, managed by states in partnership with NOS. NOAA Fisheries, the U.S. Fish and Wildlife Service, and the National Park Service manage other MPAs. Worldwide, there are over 161,000 protected areas on land (as of October 2010), representing about 12 percent of the world's land surface area. By contrast, only about 2 percent of the world's oceans are included in the world's ~ 6,800 Marine Protected Areas. As mentioned previously on this site, only 2 percent of the MPAs are classified as “no take” marine reserves, completely closed to fishing and other extractive activity. Most of the MPA’s in the world are “paper parks” with little restriction and enforcement. The largest MPA in the world is in New Caledonia, a small group of islands in the Pacific Ocean. It spans, according to Mother Nature network, over 320 million acres of surface area. This protected space encompasses and provides a safe and healthy home for coral reefs, marine mammals, fish, sharks, birds and turtles. For many years the oceans were considered limitless. But this view started to change during the 19th and 20th Centuries when it became evident that it was totally possible to push whale stocks to the verge of extinction. The mis-managed Newfoundland cod fishery provided further evidence. Fishing vessels became larger and larger and, as local fish stocks plummeted, they sailed further and further afield. We now have the spectacle of Asian fishing fleets in the Antarctic and European vessels off the coast of Africa. Not everyone appreciates that the oceans are not uniform. There are only a few “hotspots” where the fishing is rich. The open ocean is, for the most part, an aquatic desert. Sadly, most hotspots are in major decline. Seamounts are eagerly sought after because they act as aggregation and/or spawning places for commercially useful fish species. Orange roughy (which used to be called the slimehead) became the fish de jour for a while. But the stock was initially overfished as basic life history data was lacking. Further research revealed that they may live for 146 years, probably don’t breed until they reach at least twenty years old and possess high levels of mercury. Fishing fleets are still seeking the next fishery to decimate. A few tuna boats, equipped with helicopters search for schools of tuna in the open ocean. Outside of a country’s Exclusive Economic Zone (EEZ -200 nautical miles from the mean high tide mark) only international agreements apply. The tuna are migratory and in the vast expanses of the Pacific small island nations cannot police their EEZ. Rogue fishing nations take advantage of this to steal their fish. 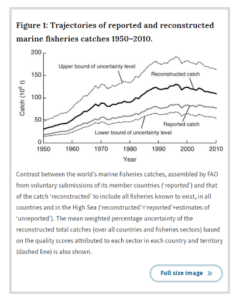 Statistics on world fish catches are notoriously unreliable. This stems from under-reporting of catches and occasionally over-reporting (it is believed that China inflated its catches for a while). But even considering the unreliability of the data it is evident that catches peaked around 1999 and have been falling ever since, despite increased fishing effort. The graph below comes from Pauly and Zeller’s (2016) comprehensive discussion of this. So, we are caught between an increasing world population and a reduction in world fisheries. The solution will require major changes in world attitudes towards fisheries resources. Apart from the obvious; stabilizing or reducing the world population, there are other things that can be done. Fish farming is probably not the answer unless the food is sourced terrestrially. Farming fish like salmon or trevally requires large amounts of processed bait fish. Freshwater omnivores like Tilapia may be a better option, with a conversion ratio that is often better than most farmed terrestrial animals (around 1.5). Increasingly, vegetable sources such as soy meal are replacing fish protein in farmed fish food. However, large amounts of energy go into producing the feed and transporting it on site. One way of reducing pressure at the top of the food chain is to eat lower down it. There is a much greater biomass of fish like herring than there are of tuna. This would require a major change in Western culture – not so much for Asian and Pacific Islanders who tend to eat all fish regardless of size. The fishing industry has much to answer for: bottom trawling destroys delicate ecosystems, a huge amount of “by catch” is simply thrown overboard. In the United States somewhere around 20% of catch is thrown overboard – in some places it can be as high as 40%. While several countries maintain a quota system which, on the surface, allows for sustainable management of fisheries, in some cases this is simply lipstick on a pig. New Zealand, often lauded for its total allowable catch system and held up as pinnacle of sustainable fishing, does not monitor catches closely, has not researched all the fish stocks, and when scientific evidence suggests a reduction in catch rate might be wise, is met with stiff opposition from the fishing industry. Almost all non-artisanal fishing or farming requires heavy fossil fuel energy subsidies. Sometimes the energy in versus the energy out is absurdly negative. If you determine the calorific value of shrimp protein caught in the wild fishery versus the energy expended to catch them there can be a disparity of 50 to 1. In other words, 50x more calories are expended than are brought to the table. This is a ridiculous state of affairs, although energy subsidies are typical in all Western farming and fishing ventures. Quite apart from the energy costs of off-shore fishing fleets there are concerns about economic costs. One study shows that 54% of current high-seas fishing grounds would be unprofitable without government subsidies. So, are there any answers? Can we continue to eat sea food? The answer is probably a guarded yes. One of the problems of today’s fishing activity is that large breeding individuals are often the first removed from the wild population. This leaves smaller individuals which are just not capable of producing so many eggs. The result is that the stocks drop because there aren’t as many young coming into the population. And, as the large individuals are removed, the industry targets the next size range until they too become endangered. This is where Marine Protected Areas (MPAs) come in. MPAs come in different guises. They have been around for many years. In the Pacific Islands it was common place to put a section of reef or river mouth off-limits for fishing. This practice has probably occurred over several thousand years and enabled these strongly seafaring cultures to maintain healthy populations, both of themselves and of their fisheries. Western societies have been slow to embrace the concept but in the last decade or so there have been some major developments. The biggest MPA is in Antarctica where 1,549,000 sq. km (598072 sq. miles) has been protected by signatories to the Convention on the Conservation of Antarctic Marine Living Resources (CCAMLR). The next biggest is Papahānaumokuākea Marine National Monument (1,508,870 sq. km) in the waters round Hawai’i. While several other MPAs were considered for size reduction by President Trump, Papahānaumokuākea Marine National Monument was spared. A list of the world’s largest MPAs can be found here. Some MPAs can be very small and yet still have a major impact on the surrounding biodiversity. New Zealand’s Fiordland is a prime example of this. There are now 10 Marine Reserves in this fragile area and while collectively they only cover 100 sq. km, their conservation value is incalculable. 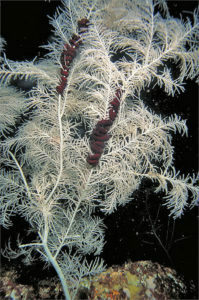 Stands of black coral, walls of brachiopods and refuges for rock lobster abound. Local communities are not always supportive of MPA proposals. Recreational and commercial fishermen argue that their catch rates will drop. Because of the safe place an MPA represents it can support a viable breeding population of commercially important species. In Fiordland for instance, protected rock lobsters provide enough mobile larvae to repopulate areas that have been subject to heavy fishing pressure. A study on the impact of MPAs show an increase in biodiversity within the area but without significant biomass increases. For fishermen the impact is mixed. Catch rates may be up to 25% higher along the MPA boundary but fishers lose out by not being able to enter the MPA. The outcome is possibly neutral for the fishermen with slight benefits from increased catch of previously rare species. These often sell for a higher price. Economics should not be the only driver of our stewardship of the planet. Our job is to pass it on to our children in a better state than in which we received it. We are failing miserably at this. Even if MPAs cause financial hardship for fishermen we need to keep the ones we have and add new ones. Professions never stay static. Who would want to be a typewriter repairman these days? For many the tradeoff between a secure job and preserving marine biodiversity is an easy choice, particularly when an MPA may well preserve the jobs of many fishermen. But without MPAs the outlook is bleak for many species. The world needs more Marine Protected Areas.